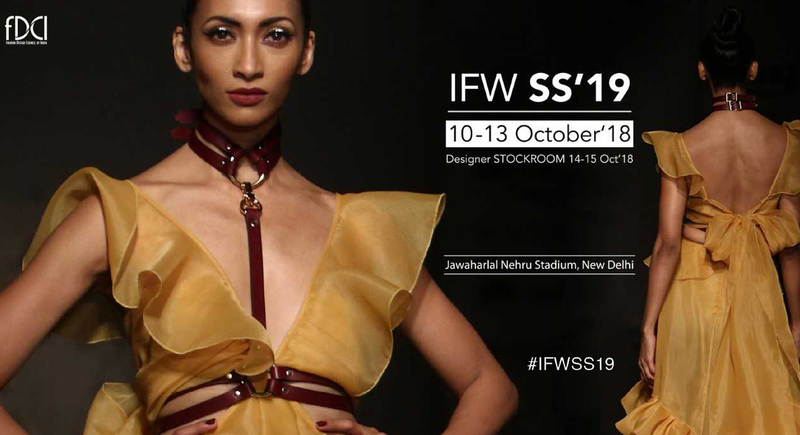 Fashion Design Council of India (FDCI) reveals the 32nd edition of the Lotus Makeup India Fashion Week(Previously AIFW), spring-summer 2019, starting from October 10-13, 2018. The four-day event will take place at the Jawaharlal Nehru Stadium, in New Delhi. Lotus Makeup India fashion week 2018 spring summer starts from October 10-13, 2018. The four-day event will take place at the Jawaharlal Nehru Stadium, in New Delhi. Thisyear, FDCI is inducts a unique concept, in keeping with the need to move with the times. The ‘Designer Stockroom’, which is a B2C theme, is aimed at giving designers an opportunity to sell their stock (new/old). The event will keep with the tradition of buyer sale for first four days and has added a new dimension for public sale on the penultimate two days, October 14-15 at the same venue, in continuation to IFW SS’19. Almost 120 designers will participate and be part of a larger canvas that will celebrate various aspects of fashion - from inclusivity to handlooms and create a new bond with nations like Australia and the embassy of Japan through the medium of fashion. Known for a sense of mystery in storylines and reticent demeanor Aneeth, yet again will surprise us with a poolside show where guests will be wearing shades as part of their dress code. Péro brand which is available in 35 countries all over the world will offer endearing block prints, breezy silhouettes and intricate detailing that will set the tone for her spring summer 2019 collection.